…looks like an apt name for several threads from this blog, which are now converging to a common point. To make it more clear, here is a modification of the figure which appears in the post Theatron as an eye. The red decorations changed. Let’s see. DESIGNERS are the new programmers. They are no longer write programs, but instead they design good behaving distributed GLC computations. They deserve the front seats for observing the actors. ACTORS occupy their right place in the greek theater: the orchestra. They are, of course, GLC actors, which are released into the wild after the preparation stage, effected by the designers. Each actor is an autonomous, reactive entity, which lives by exchanging very short, highly schematized messages with other actors (like the script one actor has, given by the director-designer; there is not very important what the actor says, only that it is communicating a repertoire of basic — emotional, in real theater — universal messages). There are many actors in the greek theater (assimilated here with the members of the chorus, to be clear), they are almost indiscernable one from another, they dress the same, they look the same, they have a very limited way of expression, but together they form the powerful chorus. Like neurons in a brain, they are in a limited variety, but they “compute” in a distributed and asynchronous way, without exchanging messages which need external competences to make sense. the USERS of this distributed computation, aka theatrical performance, are the beneficiary of the show. ACTORS CREATION: new actors are entering through the PARODOS, that’s related to the fact that the creation of new actors is a process which looks like the cells binary fission. This is implemented in chemlambda, look for example how the B,C,K, W combinators are multiplying in this post. 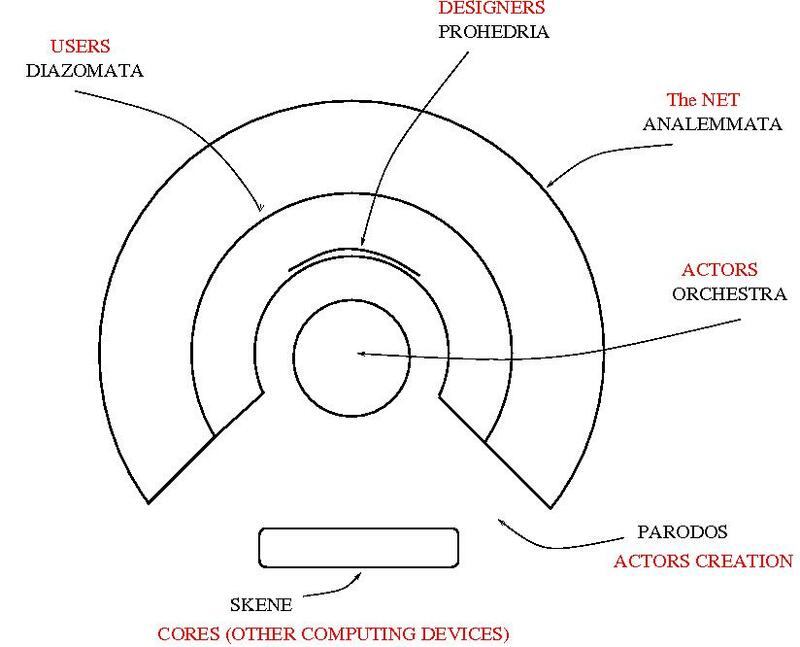 CORES: behind the skene is what should not be visible to the public or actors. This is a interface with other computing devices. like for example the coloured rectangles representing various stacks in the post A machine for computing the Ackermann function in graphic lambda calculus. Recall that each core has to be embedded in a mask (which IS the actor which is communicating with that core), or, masks are decorating the skene. Finally, all this happens in the NET. Worldwide, circled by the sun [annalema]. Previous PostRewiring of neurons, seen as actorsNext PostGLC actors, what are for and why are interesting?